Blondie and Brownie: Send Them Brownies!! Yesterday was National Brownie Day, did you partake in celebrating?! Between you, me and the internet, I didn't, but that's partly because I was baking gingerbread men and partly because I had gone through a whole box of brownies recently. By myself. I had received a box from Greyston Bakery, but before you say "bribes!" hear me out. I knew of Greyston prior due to their contract with Ben & Jerry's (and we ALL know how much I love Ben, and Jerry, and their entire R&D team). As someone who wants to change "the system," specifically to address how the lower classes are not given the opportunities needed to change their situations, I've been a silent fan of them and hoped that one day, I'd get the opportunity to visit the bakery. 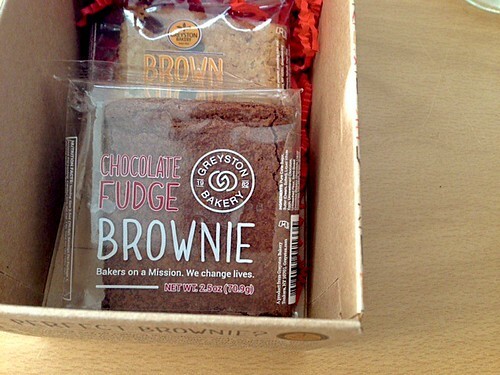 I wouldn't dare buy a whole box of brownies for myself because that's just a terrible idea. So when they asked if I would like a box, I DID IT BECAUSE I'M WEAK! And holy goodness, the brownies were like fudge and moist and individually wrapped so you only eat one. At a time. So, if you're like me and totally into the idea of sending everyone homemade holiday treats, only to rethink that idea at 9 o'clock at night when you're slightly tipsy from that day's holiday celebration, may I suggest sending your loved ones brownies & blondies from Greyston? You'll be giving money to a great bakery with a great mission and saving yourself from being covered in flour & crying. Have You Hit Up Robicellis with a Holiday Order? It's Time for the Burmese Food & Fun Fair!